Imagine – how would you get to work, to school, or to anywhere without good roads? Without passable paved roads, driveways and parking , our lives would be immensely more complicated. Of all the infrastructure that gets used constantly, pavements are one of the most overlooked and, perhaps, the most neglected. Heavy traffic, heavy loads, water and weather changes, can lead to rutting and cracking, shortening the pavement’s potential lifetime. 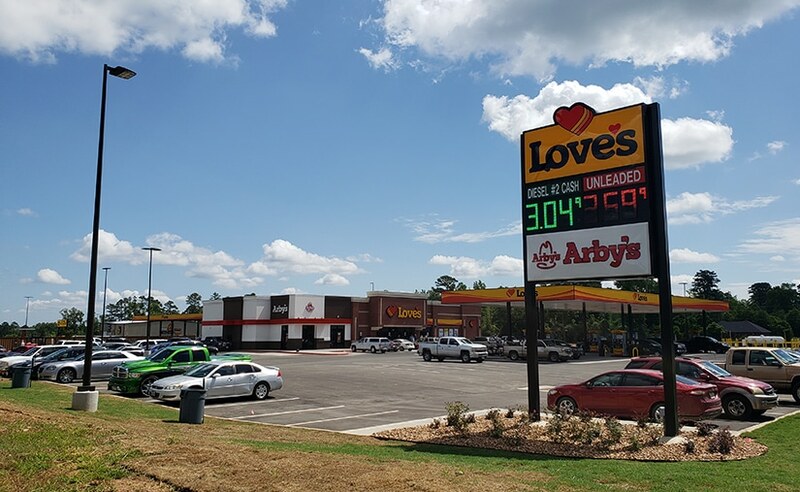 Recognizing the long-term impact of premature pavement failures, Love’s Travel Stops (Love’s) proactively partnered with Terracon to develop solutions to their pavement problems. 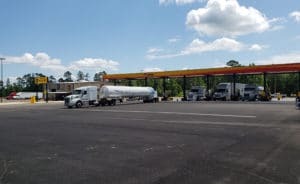 As a major national truck stop operator in the U.S., Love’s business depends on good pavements. Hundreds of trucks drive through each truck stop daily, and each one can weigh between 80,000 – 130,000 lbs. All those slow-moving, turning and idling semi-trucks wear out truck stop pavements, fast. The impacts include more maintenance, frequent major repairs, and shortened overall pavement life. With more than 450 truck stop and convenience stores in 41 states, Love’s has a lot of pavement to maintain. Our approach begins from the “ground up” with a thorough geotechnical investigation to properly characterize the soil conditions at a potential site. Because we anticipate site soils will support heavily trafficked pavements, our recommendations incorporate soil improvement methods such as chemical amendment or geogrid reinforcement where necessary or economically beneficial. Materials are an important component to any pavement system, and with Love’s heavy traffic, they are critical. To provide Love’s with the solution, Terracon’s pavement experts investigated a variety of materials and methods. Recently, Terracon recommended the use of high-capacity polymer-modified asphalt concrete materials, supplemented with Kevlar fiber . 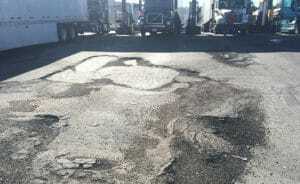 Although commonly used by state departments of transportation, this kind of asphalt is unusual in truck stops. It was selected because it performs better over a wider temperature range than conventional asphalt, and doesn’t get brittle. Construction is the final piece to the pavement puzzle, and one of the most important because even the materials won’t last as intended if not properly constructed. For example, asphalt should not be placed when the temperature is below 40° F. To prevent this issue and other problems, Terracon’s project managers and inspectors partner with Love’s and their team to observe, document and report on construction progress. Additionally, our teams sample and test to verify the correct pavement materials are used, and that construction quality meets the project specifications. And, when things don’t go as, our teams work together to find solutions. In the end, Terracon’s goal is to help Love’s manage their construction and Travel Stop operations in the most efficient and cost-effective manner by being responsive, resourceful and reliable. John Mancini, P.E., is a geotechnical engineer with over 28 years of consulting experience. As a national account manager based in Salt Lake City, Utah. John oversees Terracon’s services for several national clients with project locations nationwide.